Ever-changing in mood and pace, La Musique is a setting of poems by Elizabeth Bishop and Charles Baudelaire on the transformative power of music. 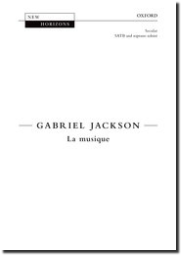 Jackson musically represents the complex psychological shifts contained in the texts' powerful metaphors through alternating fully notated and indeterminate passages in different keys and tempi. The resulting effect makes this piece a fascinating musical journey to the depths of the human soul.